One might say that Socrates was the first guy who fucked us up. Badly. And here is the reason. This is probably the single most powerful idea that even today shapes the ideals of a modern man, from our education to the rest of our lives. If you think about it for a second, it is completely intuitive. If you employ reason, you will find out what virtue is. If you know what true virtue is, you can act rationally, according to it. Virtuous behavior will ultimately lead you to happiness. Socrates’ equation turns man into a truth searching animal. The problem with the ideal of man as a truth searching animal is that he is not one. Human mind has not evolved to search for truth, but to survive and reproduce. It has adapted to live by any illusion that will enable man to gain status and make him feel good about himself. All these things often don’t have anything to do with truth, logic or any consistency in judgement. The clash of the objective state of man and the Socrates’ ideal starts the very moment man realizes that logical thinking doesn’t necessary provide any meaning strong enough to lead to happiness and fulfillment. Quite the contrary: logical thinking might even make one feel empty and that things around him are short of any real meaning. The point here is not really about the relative qualities of Hindu philosophy; it is about the fact that something other than truth might be more important to look at when searching for the meaning of the world. In his book The Birth of Tragedy, Nietzsche attacks Socrates (and rejects Plato as well) for deforming and misrepresenting the Hellenic spirit. Nietzsche simply believed that there is a world outside of formal logic. Not everything is understandable; possibly some things are not even worth understanding. There is an even richer world to experience beyond the frame of logic. Might a life completely unbounded by logic be even better fulfilled? However, Socrates set us up to view a good life only as one lived through reason, logic and theoretical understanding. Nietzsche, on the other hand, tries to describe the views of life before Socrates, and how he made them change. He deals with how change of the world views manifested itself in the changes of arts – how we went from Tragedies to Comedies and what’s essentially wrong with that. If you’ve ever read Nietzsche, you know he’s tough to summarize. Here are several of his thoughts that best convey the problem of Socrates as he presents it in his first major work – The Birth of Tragedy (1872). The mysterious teachings of tragedy: the basic acknowledgement of the unity of all existing things, the idea of individuation as the ultimate foundation of all evil, art as the joyful hope that the spell of individuation is there for us to break, as a premonition of a re−established unity. According to Nietzsche, Shakespeare’s Hamlet has many similarities with the so-called Dionysian man, hailed by Nietzsche as the man of excitement and high spirit, one that just wants to sing and dance. Dionysian man has similarities to Hamlet. Both have had a real glimpse into the essence of things. They have understood, and it now disgusts them to act, for their actions can change nothing in the eternal nature of things. They perceive as ridiculous or humiliating the fact that it is expected of them that they should set right a world turned upside down. The knowledge kills action, for action requires a state of being in which we are covered with the veil of illusion. That is what Hamlet has to teach us, not that really venal wisdom about John−a−Dreams, who cannot move himself to act because of too much reflection, too many possibilities, so to speak. It’s not a case of reflection. No! The true knowledge, the glimpse into the cruel truth overcomes the driving motive to act, both in Hamlet as well as in the Dionysian man. These method of arousing people are detached paradoxical ideas, substituted for Apollonian objects of contemplation, and fiery emotional effects, substituted for Dionysian enchantment. The fiery effects are, to be sure, imitated with a high degree of realism, but the ideas and emotional effects are not in the slightest way imbued with the spirit of art. … A key to the heart of Socrates is offered by that amazing phenomenon indicated by the term Socrates’s daimonon. Whereas in all productive men instinct is the truly creative and affirming power, and consciousness acts as a critical and cautioning reaction, in Socrates the instinct becomes the critic, consciousness becomes the creator—truly a monstrous defect. But he remains an eternally hungry man, the “critic” without joy and power, the Alexandrian man, who is basically a librarian and copy editor and goes miserably blind from the dust of books and printing errors. By contrast, what are we to make of what killed tragedy—Socratic morality, dialectic, the satisfaction and serenity of the theoretical man? Could not this very Socratic way be a sign of collapse, exhaustion, sickness, and the dissolution of the anarchic instinct? And could the “Greek serenity” of later Greek periods be only a red sunset? Could the Epicurean will hostile to pessimism be merely the prudence of a suffering man? And even scientific enquiry itself, our science—indeed, what does all scientific enquiry in general mean considered as a symptom of life? What is the point of all that science and, even more serious, where did it come from? What about that? Is scientific scholarship perhaps only a fear and an excuse in the face of pessimism, a delicate self−defence against—the Truth? And speaking morally, something like cowardice and falsehood? Speaking unmorally, a clever trick? Oh, Socrates, Socrates, was that perhaps your secret? Oh you secretive ironist, was that perhaps your—irony? Let people merely recall the consequences of the Socratic sayings “Virtue is knowledge; sin arises only from ignorance; the virtuous person is the happy person.” In these three basic forms of optimism lies the death of tragedy. For now the virtuous hero must be a dialectician. Now there must be a perceptible link between virtue and knowledge, belief and morality. With tragedy the Greeks had surrendered their faith in immortality, not merely the faith in an ideal past, but also the faith in an ideal future. The saying from the well−known written epitaph, “as an old man negligent and trivial” is applicable also to the old age of Hellenism. The instantaneous, the witty, the foolish, and the capricious—these are its loftiest divinities, the fifth state, that of the slave (or at least the feelings of a slave) now come to rule. And if it is possible to talk still of a “Greek serenity,” it is the serenity of the slave, who has no idea how to take responsibility for anything difficult, how to strive for anything great, or how to value anything in the past or future higher than the present. The salvation of man, and what will at some point give a rebirth to tragedy is the art. Thus, to be saved, it comes close to the healing magician, art. Art alone can turn those thoughts of disgust at the horror or absurdity of existence into imaginary constructs, which permit living to continue. These constructs are the Sublime as the artistic mastering of the horrible and the Comic as the artistic release from disgust at the absurd. Existence and the world appear justified only as an aesthetic phenomenon. It’s in this sense that the tragic myth has to convince us that even the ugly and dissonant are an artistic game, which the will, in the eternal abundance of its joy, plays with itself. But now science, incited by its powerful delusion, speeds on inexorably right to its limits, at which point the optimism hidden in the essence of logic fails. For the circumference of the circle of science has an infinity of points, and while it is still impossible to see how that circumference could ever be completely measured, nevertheless the noble, talented man, before the middle of his life, inevitably comes up against some border point on that circumference, where he stares at something which cannot be illuminated. When, at this point, he sees to his horror how logic turns around on itself and finally bites its own tail, then a new form of knowledge breaks through, the acknowledgement of the tragic, which in order merely to be endured, requires art as a protector and healer. If the old tragedy was derailed by the dialectical drive for knowledge and by the optimism of scholarly research, we might have to infer from this fact an eternal struggle between the theoretical and the tragic world views. And only after the spirit of knowledge is taken right to its limits and its claim to universal validity destroyed by the establishment of that limit would it be possible to hope for a re−birth of tragedy. 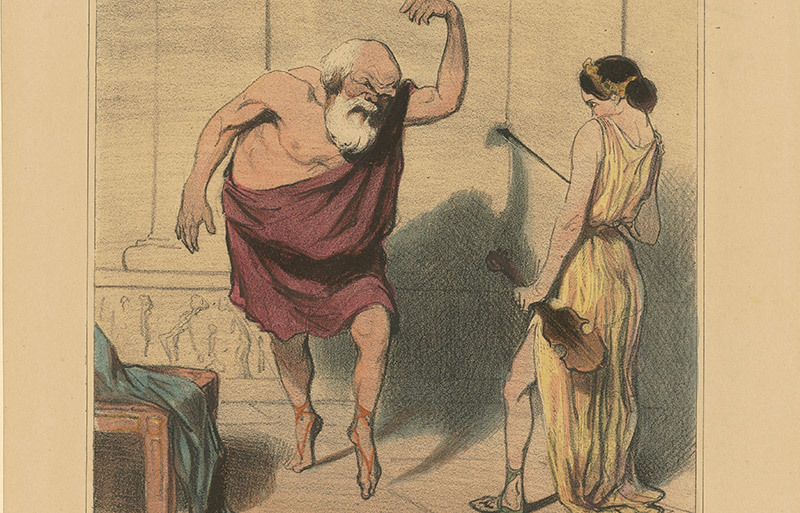 For a symbol of such a cultural form, we would have to set up Socrates the player of music. With this recognition there is introduced a culture which I venture to describe as a tragic culture. Its most important distinguishing feature is that wisdom replaces knowledge as the highest goal, a wisdom which, undeceived by the seductive diversions of science, turns its unswerving gaze towards the all−encompassing picture of the world and, with a sympathetic feeling of love, seeks in that world to grasp eternal suffering as its own suffering. Let’s imagine a growing generation with this fearless gaze, this heroic attraction for what is immense; let’s imagine the bold step of these dragon slayers, the proud daring with which they turn their backs on all the doctrines of weakness belonging to that optimism, in order to “live resolutely,” fully and completely.